President John W. McCormack assumed office on November 23, 1963, less than twenty-four hours after the assassination of John F. Kennedy, following the accidental killing of Lyndon B. Johnson by a Secret Service agent. Born into a Boston family of Irish immigrants and a lawyer by training, McCormack served in the U.S. Army during the final years of World War One and began his long political career shortly after returning. He was first elected to the U.S. House of Representatives in 1928. McCormack was a staunch democrat and supporter of the New Deal. In the lead up to World War Two, he rose to prominence as chair of the Special Committee on Un-American Activities, which sought to unmask U.S. citizens with Nazi or communist ties. McCormack also played a key role in the passage, in the face of isolationist resistance, of the Selective Training and Service Act of 1940, which initiated the first peacetime conscription in U.S. history. 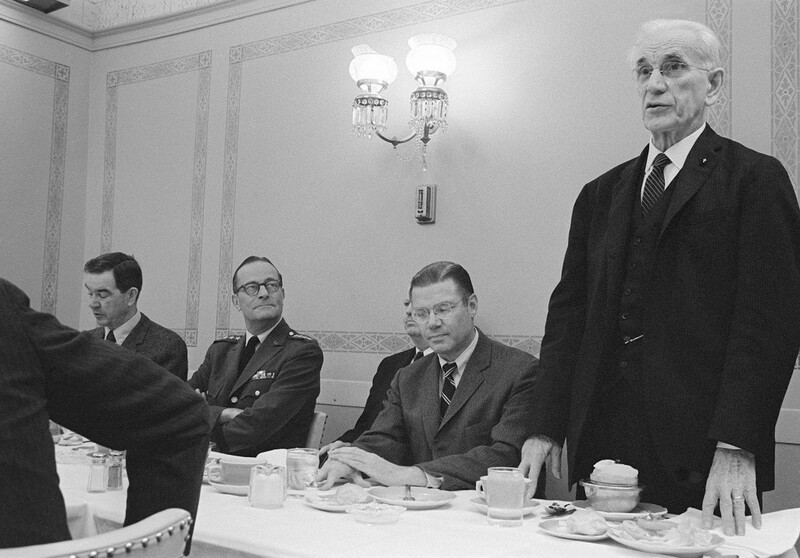 Speaker of the House John W. McCormack (D-Massachusettes) (standing), addresses those attending a luncheon at the US Capitol honoring top Department of Defense executives. Left to right are Congressman George H. Mahon (D-Texas), committee chairman of the US House of Representatives Appropriations Committee; General (GEN) Earle G. Wheeler, Chairman, US Army Joint Chiefs of Staff; Secretary of Defense Robert S. McNamara and Congressman McCormack. Despite having served in the House of Representatives since 1928, McCormack came into the Oval Office with relatively little foreign policy expertise. As a result, McCormack was initially deferential to the stable of charismatic foreign policy advisors he inherited from President Kennedy: Secretary of State Dean Rusk, Secretary of Defense William McNamara, CIA Director John McCone, National Security Advisor McGeorge Bundy, and Chairman of the Joint Chiefs of Staff General Maxwell Taylor. While managing the ongoing strategic competition with the Soviet Union always loomed, during his time in office McCormack’s foreign policy agenda was dominated by the war in Vietnam, which was at a crossroads when he arrived. Based on the advice of Bundy and others, McCormack authorized the deployment of hundreds more U.S. military advisers during the first few months of his presidency. In the midst of the 1964 election cycle (McCormack won the Democratic primary virtually unopposed), the Gulf of Tonkin incident made Vietnam an election issue. McCormack sought and won the passage of the Gulf of Tonkin Resolution in part to project an image of strength in the face of accusations by his rival in the general election, Barry Goldwater, that he wasn’t doing enough to roll back communist expansion. The resolution granted McCormack greater authority over how to use U.S. military force, which he used to deepen U.S. engagement in Vietnam over the following year. McCormack won the 1964 presidential election against Goldwater easily. Over the next two years however, McCormack grew increasingly uncomfortable with U.S. involvement in Vietnam. A veteran and staunch Catholic, McCormack wrote to the widows and families of hundreds of service members who were killed in Vietnam over the course of his presidency. These interactions had a profound effect on McCormack, and his willingness to commit U.S. soldiers to the conflict began to erode in the winter of 1965-66, as U.S. casualties mounted. U.S. troop levels in Vietnam reached a peak of 200,000 in the summer of 1966, which McCormack reduced to 40,000 by the spring of 1967. In his public speeches, McCormack cited his concern for veterans and his faith as the reasons behind his decision to disengage from Vietnam. McCormack was particularly affected by the activist Julia Moore, who brought attention how after the Battle of Ia Drang, widows were notified of their husbands’ deaths via telegrams delivered by cab drivers. In late January 1968, around the time of the Tet holiday, North Vietnamese Army and Viet Cong forces launched major attacks against the weakened U.S. positions that remained in Vietnam. 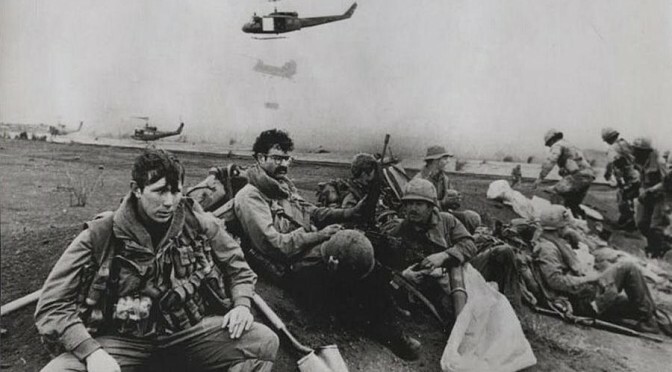 Around three thousand Marines stationed at Khe Sanh Combat Base, close to the DMZ with North Vietnam, came under siege and had to be airlifted out under intense enemy fire. U.S. and South Vietnamese Army forces fell back to the perimeter of the Capital Military District around Saigon. Although the U.S. government sought to portray the agreements between the United States and North Vietnam that McCormack oversaw as ceasefires, they were widely viewed as articles of surrender, and allowed U.S. forces to retreat from South Vietnam relatively peacefully in the latter half of 1968. McCormack took massive criticism for his decisions from foreign policy hawks who believed that he had capitulated to the Soviet Union and communism. During the 1968 presidential race, McCormack’s opponent Richard Nixon hammered McCormack on the issue of Vietnam. While Nixon publicly championed the idea of “peace with honor”, The New York Times reported that Nixon called McCormack a “traitor” in a private speech to Republican donors a few months before the election. After winning the 1968 election, President Nixon appointed a special task force to investigate the reasons behind America’s defeat in Vietnam, which became known as the Gates Commission after its chairman, former Secretary of Defense Thomas Gates. The Gates Commission was highly critical of President McCormack’s decision-making during the war and recommended that the responsibility of commander-in-chief should be shared by the president and the Joint Chiefs of Staff, rather than be the sole prerogative of the president. However the recommendations never materialized because of concerns about their constitutional legality. After leaving the White House, McCormack became a fellow at Boston College, where he wrote a memoir of his long career entitled “Leadership in Turmoil”. He died in 1975. Ben Lamont works in the Asia program at The German Marshall Fund of the United States.